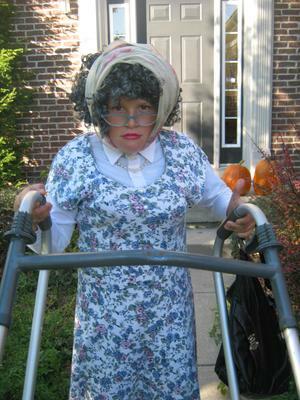 My son is dressed up as a Grandma. He thought it would be funny and silly. His friend would dress up as a Grandpa. I took him and his friend to goodwill and he went shopping. He found a dress, wig, purse, walker and scarf all at Goodwill. He has a great personality to go along with the costume if you saw him in person. He came up with the name Grandma Thelma! Return to Photo Contest for Kids. 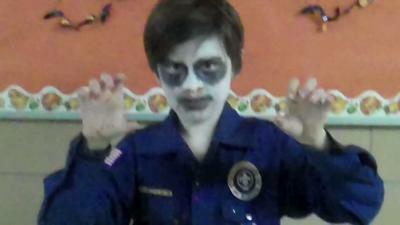 I wanted to be a zombie cub scout. My mom put on my make up, and I used my cub scout shirt. It got wet during the night from the bobbing apples. The makeup was itchy, but was worth it. I scared my mom,and my pack master. I can't wait until next year! I might not put on makeup again, but I want to be scary! My son wrote the above with my help (his mom) I was very proud of him as he has SPD and adhd and putting on the make-up and doing his hair, and being around all the people without anxiety is huge for him! Emery is 2 years old and loves to dress up. This is her Halloween costume. 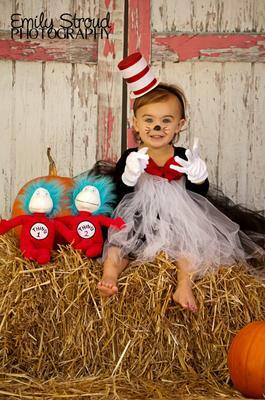 She looks at books and watches Cat in the Hat videos and was tickled when she received Thing 1 and Thing 2 for her pictures. 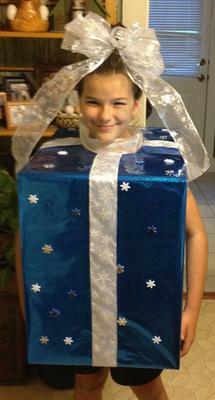 My daughter, Maddy, is showing off her costume that she helped create. She and her sister decided this year to do something different than they had ever seen. They put their heads together and decided on a theme. Her sister wanted to be a Christmas tree so she decided that she would be her sister’s present. We took a medium sized box and cut out two holes for her arms and one for her head. Then we wrapped the box with brown craft paper to add more support, and then followed up by wrapping it with blue Christmas wrapping paper. Once the wrapping paper was on the box we went back and cut the arm and head holes out once again. Finally, we glued ribbon along each side and then glued plastic confetti snowflakes onto the box. To add more decoration to her costume we pulled up her hair into a bun and placed a large bow on her head and wrapped ribbon around her neck hole. She is now ready to have a wonderful and fun Halloween. 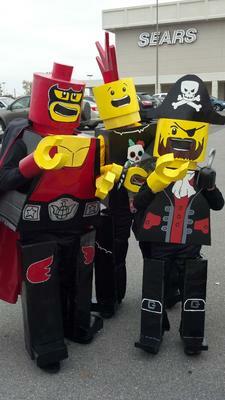 This year I decided to make Lego men costumes for my kids. I used cardboard for the bodies, which I covered in joint compound. I sanded them, primed them, and spray painted them w/ a gloss finish. Then I painted each design by hand. For the heads, I cut circlular poster board, and wrapped it around w/ a thick poster paper for the face. 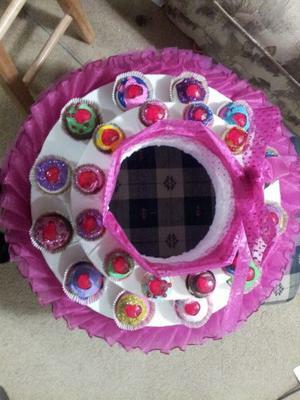 The mouths were cut out as eye holes and covered w/ a black mesh. They were spray painted. The hands were cut out from foam board, wrapped w/ foam on the sides. I also did joint compound and primer. Then the wrists were made from cereal boxes w/ pencils stabbed through them, then covered with foam and painted. The legs were a nightmare for the kids to walk in! They move VERY SLOW in them. They were made from styrofoam that was covered in poster paper and spray painted. I rigged old shoes to the legs because the legs kept twisting sideways! I hot glued velcro straps to the legs that strapped in the back. The hat & spiked hairdo were made from cardboard. outcome. They got to be the center of attention and they won a radio disney contest vs. 300 other kids. It was all worth it! 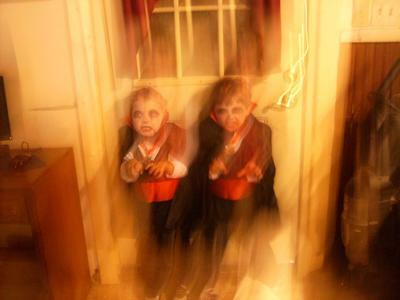 This photo was taken to enter a local halloween contest for our community. 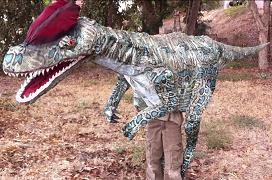 This costume is homemade and was featured in our state newspaper twic. 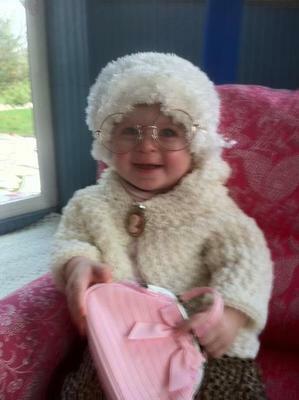 My daughter's name is Sophia so I thought it would be fun to dress her up as Sophia from the show, The Golden Girls. I knitted a white hat/wig for her and bought old lady glasses, found a pin, purse, and aknitted sweater and fun leopard pants to finish it off. I hope you like it! It was a hit and all of my family and friends could not get over it! A little girl put regular batteries in my charger, and without knowing, I put the batteries in my digital camera and it apparently affected the contacts in my equipment, so occasionally I get double exposures and fuzziness on the pictures, as you will see. The boys were allowed to wear their Halloween costumes to school so I got the boys ready for school and took a shot before the bus ran. This is inside the house in front of the back door. I am intrigued to see in the windows behind the boys there appears to be more of them coming through the wall as the boys did. 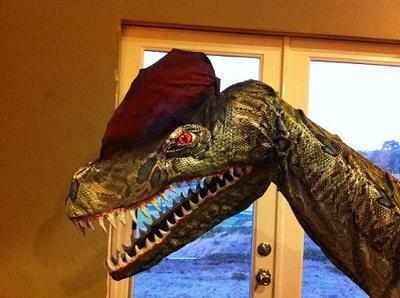 This is a costume I made for my almost 7 year old son. 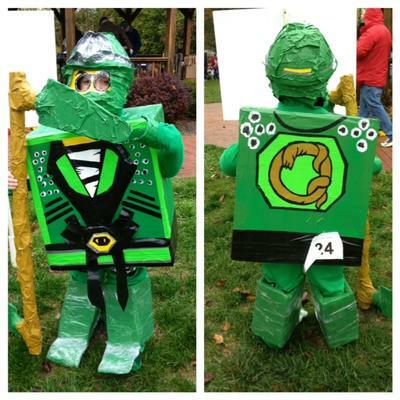 He LOVES NINJAGO, but they do net sell costumes. That's ok - I love Duck Tape!! The basic components were: a large box, Duck Tape (THIS BRAND, NOT any other), spray paint, lots of types of glue, green sweats & hoodie and Sharpies. 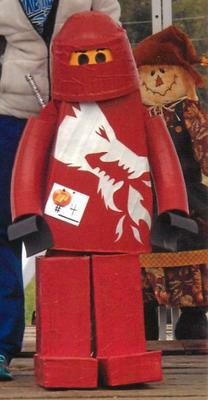 The Lego feet were made by cutting apart a styrofoam cooler - the top of the head started with an hard plastic bowl. Every year my kids and I go shopping at the thrift for our costume ideas. 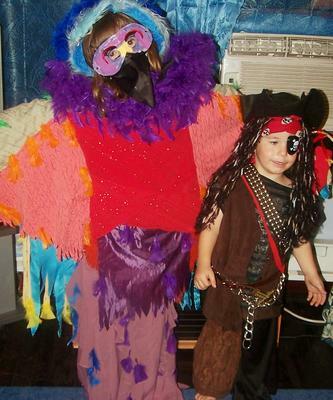 This year my 3 year old is a pirate and my 9 year old daughter his parrot. For the pirate costume we already had alot of pirate items like the hat, we only bought a few accessories,a brown vest and made a wooden leg and small parrot for his shoulder. The wooden leg was made with foam cusion wrapped in brown cloth made to resemble wood. The small parrot on his shoulder made with a red sock filled with foam and wings made from different color material and a added pirate hat(pet costume hat bought). My daughter's parrot costume took a little time to accomplish with the layering of colors. 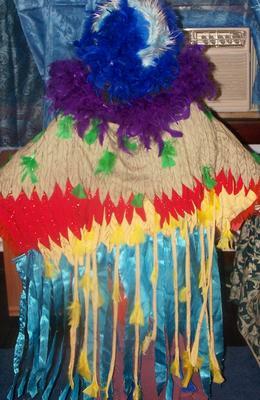 We made different color material to resemble feathersand attached to a poncho we had laying around.we used a skirt from the thrift store to add some feathers to for the bottom and a blue fuzzy hat with added feathers for the head. The beak was made from the pointy part of a witch's hat adding a pipe cleaner under it to shape it. The brim of the hat used around her neck for the purple feathers it had on it. My two year old loves books. He insists to be read over 20 books a day. We have purchased, checked out and read so many books in the past two years. He loves all types of books but he really enjoys books from songs. One of his favorites is Old Mc. Donald. As we read to him, he joins in by making all the animal noises. He also loves to dance and goes around dancing to a small recorder with classic kid's songs. Old Mc. Donald happens to be one of the songs he dances to. He is a happy toddler who loves his stories and music. I wanted to make him a costume about something he was passionate about. I chose this costume since it was a character from one of his favorite books and also one of his favorite songs. He loves dressing up in his overalls and role playing feeding hay to his animals. The best part of it all is to see him hug and kiss the animals. He is a true animal lover! He is wearing a pair of jean overalls, a Tiki hat from the Dollar Store and his father's old red bandana. 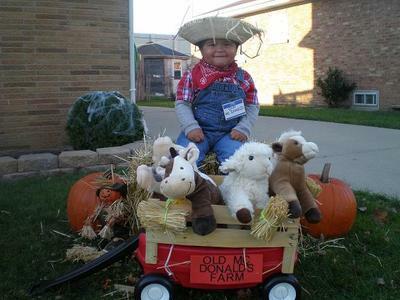 His stuffed cow, horse, sheep and pig are taking a ride on his red little tikes pull wagon. The wooden part of the wagon was made out of wood wine cases. They were cut and stapled and placed directly on top of the wagon. The animals are surrounded by hay and small hay bales made by hand. They are being held by pipe cleaners. 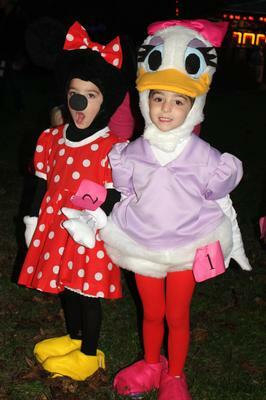 My 3 year old twin girls wanted to dress as Minnie Mouse and Daisy Duck this year. 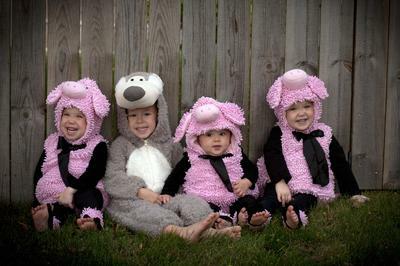 They asked their Nana to make them costumes, and after buying some faux fur, felt, satin, and cotton polka dotted fabric, this is what she came up with! I always want to be just like my dad, so when he shaved his head so did I! 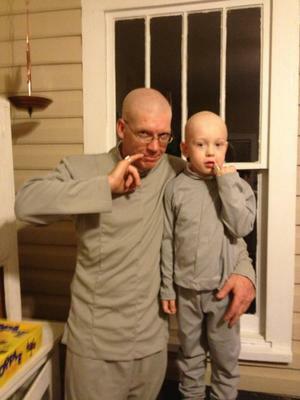 My dad came up with the cool idea of him and I being Dr.Evil and Mini Me for Halloween. We had such a blast, and everyone loved it! I am so much like my daddy that the theme really fit for us! I am a very energetic, highspirited child, but on Halloween I could really enjoy my daddy and me time together. It was so much fun and a good break from our usual routine days. We often get caught up in the stress of managing my hyperness, that we forget to make memories and enjoy these moments, but tonight lots of awesome memories were made, that we will always remember! Oh and mom got tons of pictures too. Alaina as Katy Perry in her "Cupfake" Dress! This is my daughter Alaina. Her absolute favorite recording artist is Katy Perry and so it was a "duh" moment when I knew she would want to dress as Miss Perry for Halloween. But... she wanted to be Katy Perry in her cupcake dress, specifically. So... I made that happen. The skirt is styrofoam rings, with plain white fabric sewn on, and then sewn together. Ribbon and tulle were then sewn on for the band and the ruffle. (All hand sewing!) 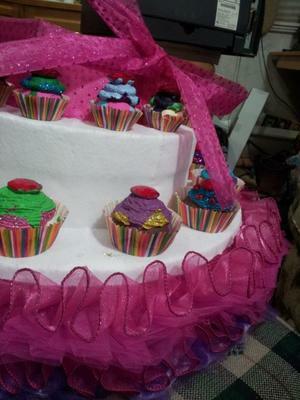 The "cupfakes" are plastic ornaments and ping pong balls, painted and glued into liners, and the frosting is a mixture of air dry clay and glue, which I then painted and glittered and attached to the skirt. The top is lycra, and has rhinestone and sequins sewn on, with an attached ruffle. The wig and headband are the only pieces that I did not make. 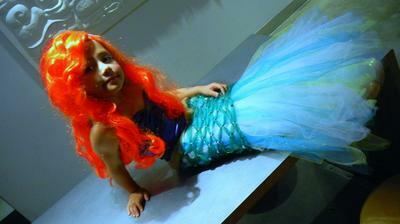 Alaina adored her costume and it made her feel like a princess. The pride and joy she had wearing it made the week's worth of work I put into it completely worth it. My pretty little girl is going to be a flower this go around. 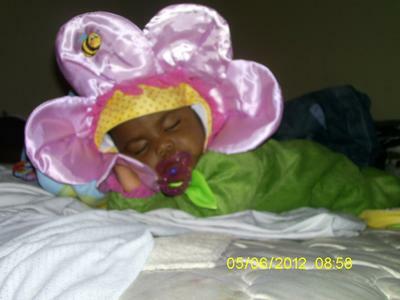 I just bought her costume and wanted to try it on her while she was sleeping. Help, your my only hope, Obi Wan Kenobi! We decided to do a Star Wars theme for Halloween this year, so I started with making Obi Wan Kenobi. His costume is completely homemade except for his boots. I also made him a jedi robe, which isn't pictured. I also made my son's jedi-in-training costume except for his boots. 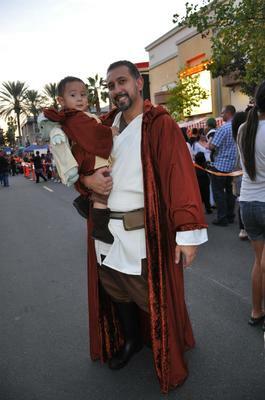 His jedi robe was also made by me. My costume is Padme. I made her completely. Her boots, holster, arm bands, and pouch are made from craft foam that was shaped and painted. Her blaster is made from a water gun spray painted silver. 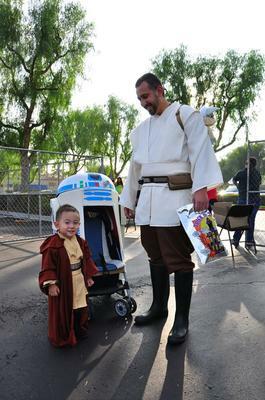 I made our R2D2 stroller out of cardboard, a big basket, plaster, paper mache, and alot of tape and paint! I spent several weeks, many sleepless nights up, making these costumes, but the reaction we got from the crowds was AMAZING! 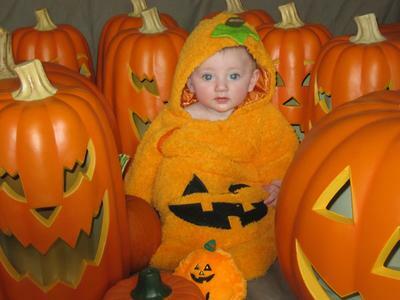 This is a photo of my six month old daughter, Bridget dressed up for her first Halloween. The photo was taken on October 23, 2012. The pumpkins in the background are Halloween decorations I had purchased from Target. I was trying on Bridget's pumpkin costume and thought I'll sit her in the middle of the pumpkins and take a photo for my dad. I showed it to my family and everyone thought it was cute. 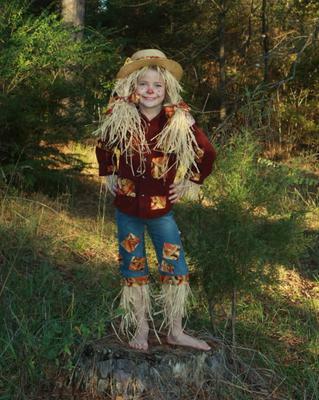 My dad commented that she was in the pumpkin patch looking for the "Great Pumpkin." Bridget will be going trick or treating to a few houses this Halloween dressed in her pumpkin costume. 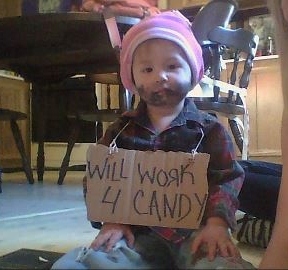 She will also be helping me give out candy to the neighborhood children. Bridget is very outgoing and loves Mickey Mouse. She has recently started eating solid foods. She loves to giggle and is trying to learn to crawl. She is a happy and healthy baby. I asked my five year old son Blade what he wanted to be for Halloween. He quickly replied Lego Ninjago! Total time spent 15 hours. Total money spent $9.00. This costume won 1st place and BEST OF SHOW at a local competition. The body and legs are cardboard. The arms and hands are PVC pipe. We used a basket for the head. All wrapped in Duct tape! The dragon was drawn on cardstock paper, cut out, and then spray painted. Shes a homless man . She will do dishes for candy! 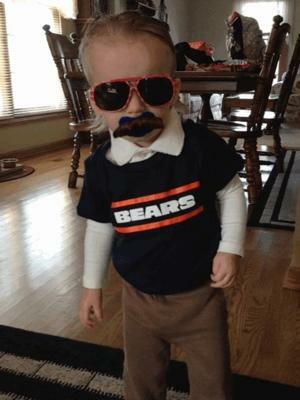 My daughter Charlotte, 16-months, is Mini Ditka. You got a problem with that? DA Coach! "Now, gentlemen, let me ask you this: What if Ditka was all of 14 inches tall, you know, about so high? Now, what's your score of today's game?" Halloween: 14. Mini Ditka: 35.